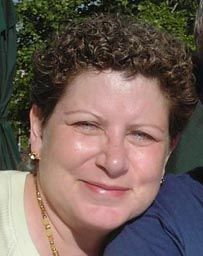 Rachel Malkin, before she cut off her hair. "My hair looked fabulous," said Malkin (aka RylandCurl on CurlTalk) of Bethesda, Md. "People always wanted to touch it. Men went crazy over my hair." But early last year, she discovered that the lump in her breast was cancer. "The surgeon looked at me with these sad, soft eyes and this gentle face," Malkin recalled. "He put his arm around me and said 'I'm sorry Rachel. It's cancer.' So life changes." After her mastectomy in March, she started chemotherapy — a potent blend of chemicals she would receive every two weeks for four months. In addition to eradicating her cancer, she would lose the curls she had finally come to peace with. Chemotherapy hair loss is an unfortunate, and emotionally devastating, reality that many cancer patients face. It occurs over a period of days or weeks and may include hair loss on the entire body, including eyebrows and eyelashes. There is little that can be done to prevent the hair loss. 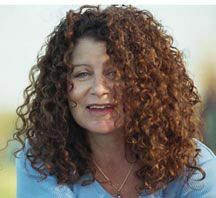 Cutting off her curls because of chemotherapy-induced hair loss was one of the hardest things Rachel Malkin has had to do. But she loves her new short, easy-to-care-for 'do. Then she sat outside on a freezing April day as her boyfriend took a pair of clippers and shaved her head. The inch-long style resembled GI Jane, Malkin said. Those who choose to shave their heads should use a guard to make sure it's not too short because the scalp can be especially sensitive. Those thinking of getting a wig should get fitted before they start treatment so the stylist can get the best match possible. But for those who find wigs uncomfortable, there are other options. In 1990, Galland was diagnosed with Stage II breast cancer. The cancer diagnosis, combined with the loss of her hair from treatments, was devastating. Galland, a professional hairstylist, searched for attractive head coverings, but found few options. So when Galland's cancer went into remission, she scoured the country looking for head coverings that were stylish, comfortable and affordable. The result of her search is Headcovers.com, which has many styles especially made for the site. Malkin initially thought she wanted to wear a wig, and she even toyed with the idea of getting a straight style. She ended up wearing scarves instead. While going through the experience, a crucial thing to remember is that the hair will grow back. Regrowth, which usually occurs six to eight weeks after treatment ends, can pose its own challenges. In many cases, the hair that grows back may be dramatically different in texture and color than the hair that was lost -- at least in the short term. 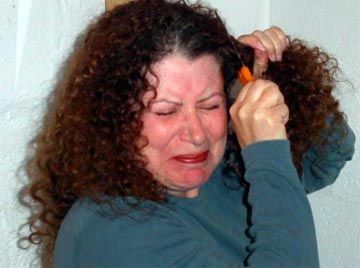 In many cases, women with straight hair may have hair that comes back curly. Although not much is known about why this happens, Dr. Jennifer Griggs said the chemo affects rapidly growing cells more than slowly growing ones. Hair follicles in the scalp grow rapidly, and they are jolted by the chemo. Some women with curly hair may find that the new hair is straight. Over time, without further treatment, the hair follicle usually settles back into its old habits. When the hair returns, it is important to handle it with a great deal of TLC, said Ouidad. She recommends using a deep conditioner such as her Ouidad Deep Treatment every two weeks. This month, Ouidad is giving 50 percent of the proceeds from every sale of a specially designed pink Ouidad Deep Treatment to the Breast Cancer Research Foundation. It is also important to get a trim every 10 to 12 weeks to keeping the new growth looking its best. As for color, it's better to wait a while. By July, Malkin was done with treatment and her hair began to return. Then the downy straight hair turned curly. And the whitish blonde turned steely gray and then dark brown. Although curly again, her hair's texture and color both are different than they were before chemo, she said. By last December, she was wearing it in a short, curly style. Nine months later, she has decided to keep it short. Although she misses the attention her long curls garnered her -- 'the way men turned around and stared' -- her shorter locks are much lower maintenance. She no longer obsesses about products and now buys whatever is on sale. For those going through chemo, Malkin said it's important to mourn the loss of their hair. But she believes the experience has also given her a renewed appreciation for her hair. Short Hair: Cut your hair short if you are expecting hair loss during chemotherapy. Since hair often does not fall out evenly, some find losing short hair is less distressing. Wigs: If you are interested in purchasing a wig, the best time to do is before you lose any hair. This helps the stylist create the best match. Many insurance companies will pay for a wig, so be sure you have it written as a prescription from your doctor. There are wig stylists who specialize in wigs for cancer patients. Caps and scarves: Some people find that the easiest and most comfortable options are caps and scarves. These range from those you may already own to custom items made expressly for people who are undergoing chemo. Check out www.headcovers.com. You might also want to check with your local chapter of the American Cancer Society. They sponsor a program called 'Look Good, Feel Better.' the program addresses ways to tie scarves and ways to make yourself look and feel better while experiencing hair loss. Pat your hair dry rather than rubbing it. Brush or comb your hair gently with a soft hairbrush or wide-toothed plastic comb. If you have long hair, avoid plaiting it as this may damage it. Avoid using elastic bands to tie back long hair. Avoid dyes, perms and other products containing strong chemicals. Avoid products containing alcohol, such as hair spray, which can irritate the scalp. Avoid excessive heat from heated rollers, hair dryers and hot brushes. You may want to wear a soft hat or turban in bed to collect loose hairs. If you decide not to cover your head, use a high protection factor sunscreen at all times because the scalp may be very sensitive. If your scalp is dry, flaky or itchy, you can use unperfumed moisturizer or natural oils such as almond or olive oil. You may prefer to use aromatherapy oils, but it is best to consult with a trained aromatherapist. Avoid perfumed deodorants if you have lost hair under your arms from chemotherapy because it can irritate the skin. Baby powder can be used instead. This month, Ouidad is giving 50 percent of the proceeds from every sale of a specially designed pink Ouidad Deep Treatment to the Breast Cancer Research Foundation.2005 marks more than 20 years that National Breast Cancer Awareness Month has educated women about early breast cancer detection, diagnosis and treatment. Mammographies are a woman's best chance for detecting breast cancer early. When coupled with new treatment options, mammography screenings can significantly improve a woman's chance of survival. Oct. 21 is National Mammography Day.Women who have lost their hair can choose from a variety of headwear options, available at Headcovers.com.